Sometimes when we were working at Chedworth Roman Villa… in Gloucestershire. 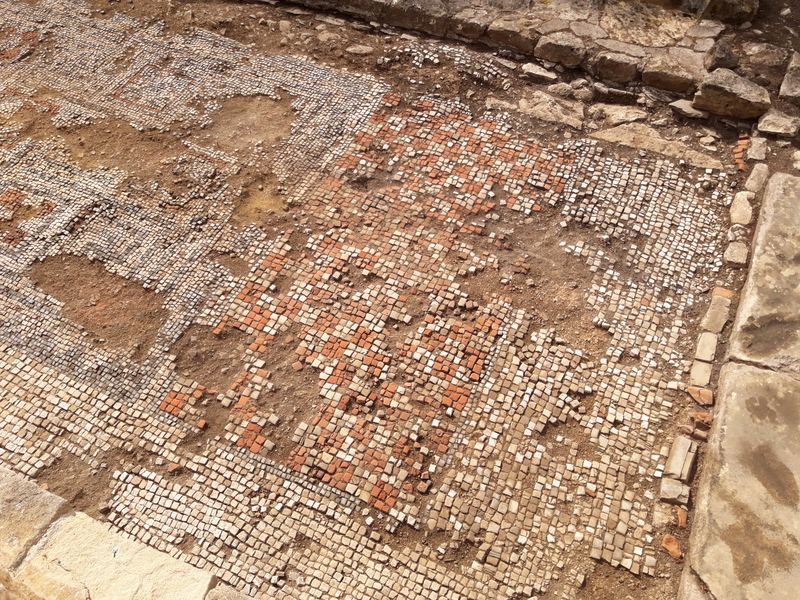 We were asked about mosaics…where do the bits…the tesserae come from? Occasionally my mind returned to 1984… and a small trench in Dorset. 2 years and about 50m from the National Trust. I am in a wood. There are three of us there. We are checking what remains of the Roman archaeology in an area… riddled with 18th century clay pits. It is Spring. The dappled light filters through the trees. I have worked all morning and am deep down in my 1.2m square test trench. We will meet up at lunch-time but for now I have filtered out the sound of the occasional cars travelling from Wareham to Corfe. The unfolding leaves and flowers of late March are above me. Down here I have a finds tray, a bucket, a hand shovel..and my trowel. The soil is light, sandy… and black…enriched by the activity of ancient lives. I am crouched down, contained in a square world. There is not much room here but this is definitely a Roman place… unmolested by the old clay diggers. The trowel blade skims the soft earth surface and catches… sending a familiar vibration through to the handle. A brown cube flicks out of the ground and I pick it up and put it in the finds tray. It joins the others, typical of this Isle of Purbeck … This whole area was an industrial centre in the Roman period. So in my tray there are colours that reflect the varied rock types across this landscape.. a mini geological world, A mosaicist’s dream. My latest find is a purple-brown gritty Heathstone from the land bordering Poole Harbour…north of where I am crouching. 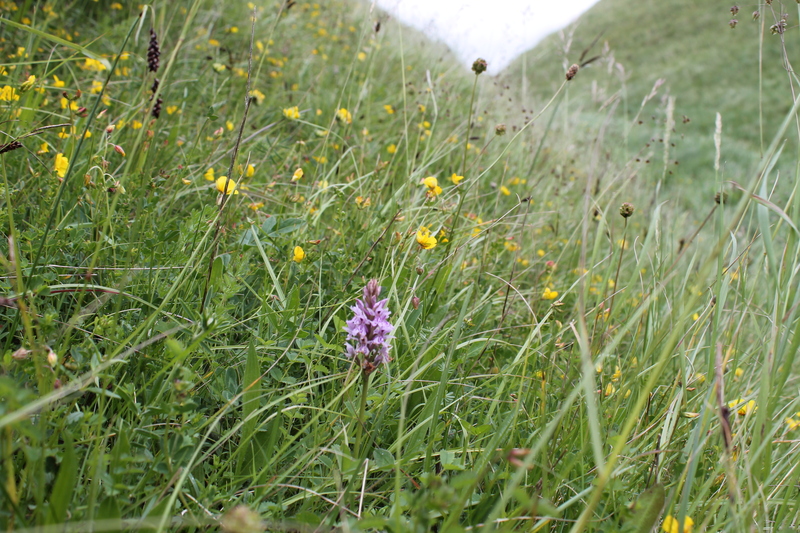 Then there are white cubes dug out of the chalk ridge behind me……there’s an old quarry… just a short distance away. There are also brown mudstone tesserae and various Purbeck limestone ones… dug from the land out beyond the ridge to the south. You can imagine the patterned floor makers coming to this place and picking up these coloured cubes in carts.. in their thousands. Norden was the heartland town of Industrial Purbeck. Three lesser villas surround it. High above me are the picturesque ruins of medieval Corfe Castle guarding the gap through the chalk ridge (like a natural rampart dividing Purbeck). 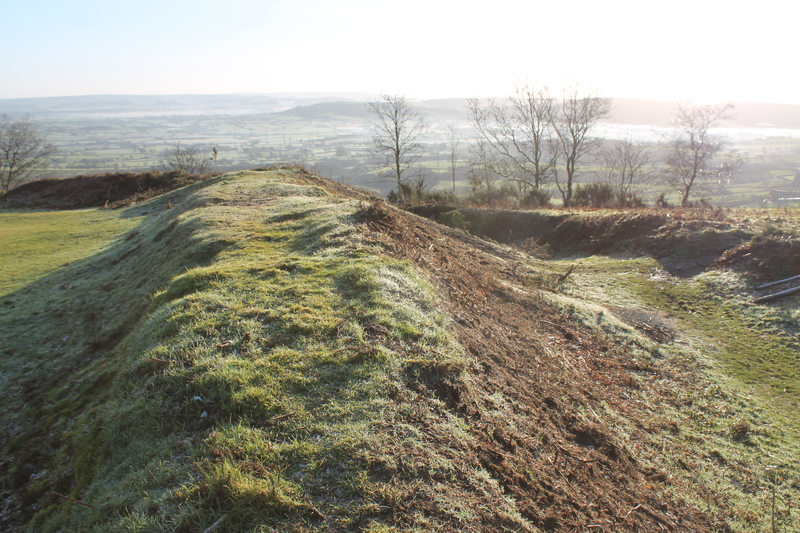 The church and Corfe town now lie to the south… but the Roman town lay here at Norden. Here in my trench are baked clay fragments…briquetage….remains of containers for evaporating brine to make salt from the Poole Harbour shoreline. There are pieces of a black, greasy, wood-like stone. I find fragments and circles with chuck-holes in (‘coal money’). These are the waste from Kimmeridge shale, turned on a lathe. It outcrops on the north-east coast of the Island. A cottage industry across Purbeck … making bangles, vessels and furniture from this easily worked …unusual material. The best thing…. I concentrate on making the sides of my trench vertical… is the Black Burnished pottery. So much of this distinctive pottery was made here that the army took out a contract and used it to supply the troops on Hadrian’s Wall. My trowel sweeps and defines a curve where the black soil stops and black ceramic begins. In my tray are many small fragments. Some are remains of jars, straight sided bowls, jugs and lids but this find is almost complete… a dish with oval base and a curved handle at each end. It still has the wavy decoration inscribed by the potter…. 1700 years ago…it resembles a simple spirograph design. I dust it down and place it on the floor of my trench as though setting a table…. 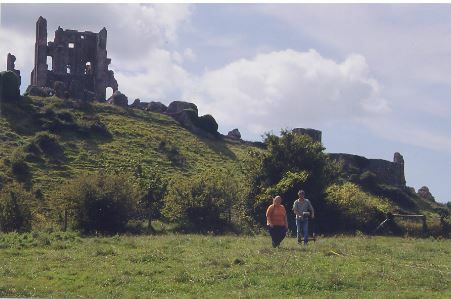 A few years later… I was in the neighbouring field …part of the National Trust’s Corfe Castle Estate. A water pump was leaking and I watched the trench. 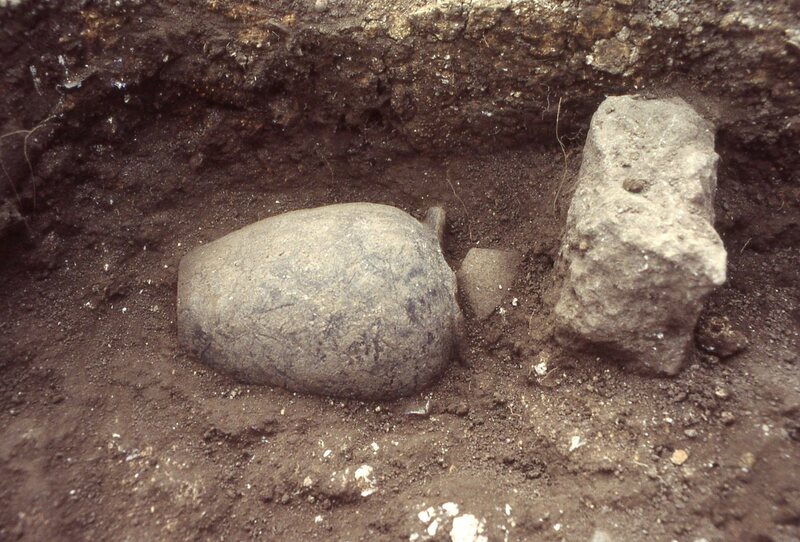 Here was Roman Norden again two chalk and gravel yard surfaces… one above the other.. laden with Black Burnished pottery fragments and oyster shells. And later still.. across the road above the NT Castle View visitor centre we geophysed the field and found a Roman temple site. This whole area is covered in traces of Roman activity…though now only farmers’ fields and modern Corfe has retreated …to the south side of the gap.. towards one of the villas. Overlooking Norden and Corfe… we found that the high ruins of the Castle were built on another Roman site…at the deepest level against the chalk…we found pottery in the West Bailey but can only guess what type of site it relates to. Perhaps there was once a Roman watch tower here, its guards gazing out across the activities of the craftsmen of Norden town towards Poole Harbour. Yesterday, the four of us sat at a table outside the Red Lion. George and Erica had just shown us an extraordinary walk. I felt a little embarrassed… but to be fair I don’t know Avebury very well. Nick and Briony are the NT archaeologists here. which guides you northwards into great Avebury Henge. ..Wow! We climbed the bank and walked the south-east quadrant (a place of buried megaliths) until the road into the enclosure… which we followed to its centre …where lies the Red Lion Inn. We drank tea in the weak sunshine, sheltered from the wind, watching the people in this busy place. George asked what motivates us to write. I thought… not necessarily for others….because you want to…because you have to… to capture a moment. You must understand… that for most of the time I write scientific reports…..reference evidence to past papers…filter the strands of the past to move understanding on.. a little..
‘Went to Avebury Stone Ring and Donnington Castle and Stonehenge. We got lots of booklets. The weather was windy with intermittent rain but it was great walking along the top of the huge earth banks of Avebury, the steep drops to the ditch on one side and the countryside stretching for miles on the other. The sun shone through the clouds showing moving patterns of shadows flowing across the green wheat fields. The wind blew hard and you could almost lean on it and not fall over. Walking along a double row of stones that lead from Avebury through the fields of sheep and rough grass. It started to rain. It was almost horizontal so we sat behind one of the big stones and watched the cars go by, as dry as you like. We waved at the cars and they waved back. On arriving at West Kennet, we were intent on finding the long barrow. At last, we ran across a huge field of wheat and came to it in the middle of nowhere. I entered first and walked past the side chambers to the back of the tomb and sat down to read the guide book and wait for the others. Shocked a stranger as they entered to see me there. during that first visit ….but you never know what you’ve got till its gone. We needed to go to a meeting and I hate having to dodge the traffic on the A303. Paul said ‘no’ so we risked it. A dodgy place to be at the end of January. I’ve done it in thunder and lightning… which is not recommended. This time the weather was gentle, sun and high cloud.. and the light.. low and revealing, teasing out the earthworks. We parked by the generator and walked from MoD land into the National Trust Estate. The view west along the 2.8km of the Cursus. The trees have been cut back to reclaim the view. The fence line follows the south line of the bank and ditch of the Early Neolithic monument. In the far distance can just be seen the gap in the Fargo Plantation at the west end. Just past the gate, I pointed out the Cursus… From this vantage point you can seen the entire length of it. The ends picked out by gaps cut through the trees. Fargo Plantation 2.8km to the west had been cut back in the 1980s and at the east end, where we were now standing…the 100m width of the cursus has been opened up in the last decade. The 1877 Ordnance Survey maps shows the east end of the Cursus and the long barrow before it was damaged for a trackway in the early 20th century. I remembered 1999 when the National Trust first acquired this land. Simon the ranger and I took the Landrover out towing a trailer full of fencing stakes and we enclosed out the burial mounds to protect them from further ploughing. 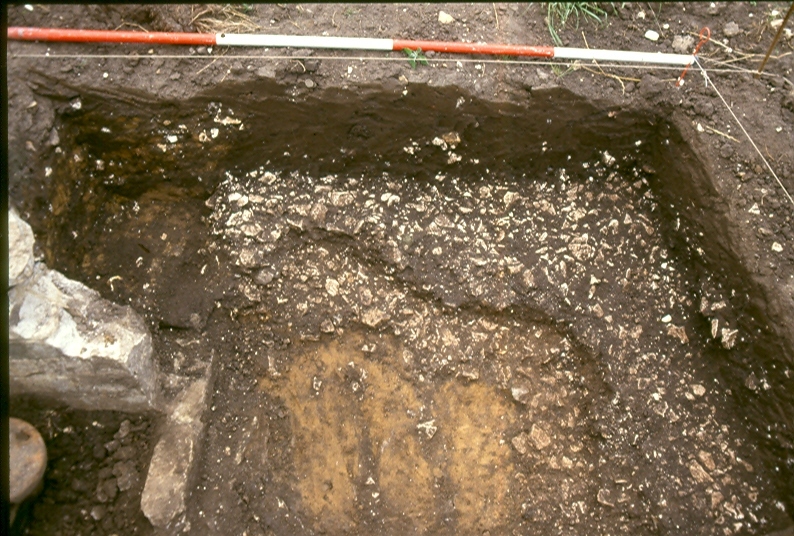 The excavation of the east side ditch of the Cursus long barrow in 2008 . The line of the trackway follows the trees on the right hand edge of the picture. 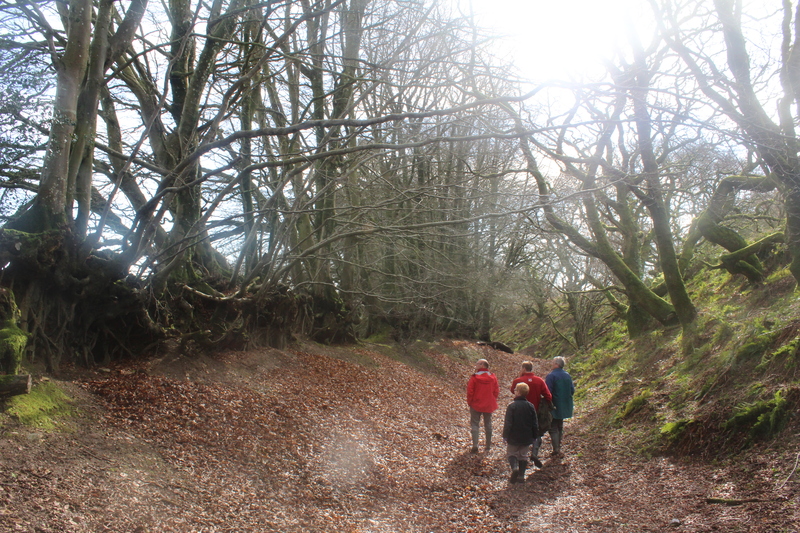 We walked on past Early Bronze Age round barrows under clumps of beech trees, part of the designed landscape planted for the Marquess of Queensbury. It is said that the clumps of trees commemorate the positions of ships that fought in the Battle of the Nile in 1798. This may be true but the trees prevented Sir Richard Colt Hoare and William Cunnington digging here in the early 19th century and so these tombs remain. Some were disturbed by the storm of 1990 when falling trees tore up Bronze Age cremation burials in their roots. One of the round barrows which still has its c.1800 beech tree planting. We turned the corner and could see little Stonehenge far below us.. etched sharply in winter sunlight. Stopping by a sign and pedestrian gate I told Paul that this was the true way to the Stones. Why?…because this is the route of the Avenue.. its route was deliberately set out to dramatic effect. 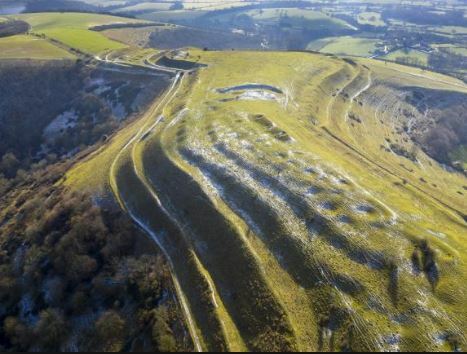 The way leads down into the valley bottom where the monument is hidden and then turns and leads you up.. and the trilithons rise from the ground in front of you as you are drawn towards midwinter. The days can only get longer once the high trilithon has caught the sun. The line of the Avenue pointing towards Stonehenge with ditches on either side as revealed during excavation, part of the Stonehenge Riverside Project in 2008. 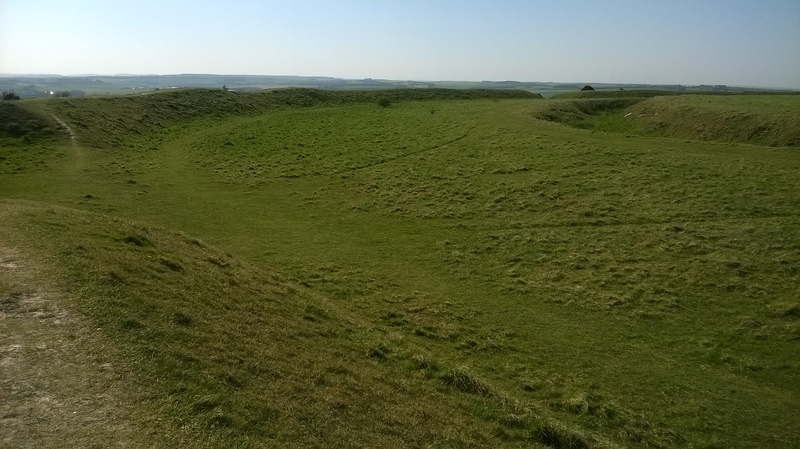 Now, we were almost there… and we walked beside the line of high King Barrows..alive and etched by low light filtering through the army strands of long grass…amber pink flicking in the wind. On a mound top, a black silhouette appeared, stood still, gazed out and fell away. In the last blog, I invited you into the middle of Kingston Lacy north park, asked you to set your time machine to 1371…and to descend almost 1m down onto the floor of the medieval hall. Though…we arrived at that level in 1997, via archaeology, our present most effective form of time travel. This archaeology time machine was not a gismo with circuits and wires but a small band of brothers and sisters wielding spades and trowels. Then, at 0.7m down.. a sudden change, the ragged gritty orange brown rubble stopped. At this level, there was a rich dark loam. Discoveries flicked out of the dirt as we touched them with the tips of our trowels. A small black brown sherd of cooking pot; part of a green glazed jug.. fine enough for the table; oyster shells and many meat bones…roe, fallow and red deer, hares and rabbits, song birds and poultry. At 0.8m, we arrive at what remains of the floor…the yellow and brown shiny surfaces of glazed ceramic tiles. We touch the remain of their food… the surface they walked on. Nobody has been here since the medieval period. The great hall, the many chambers and St Stephen’s chapel lie all around us. In fitting fashion with splendid revels they rode to the court to dance carols. For there the Christmas feasting was continuous for fully fifteen days. ‘While New Year was so new that it was only just arrived the company was served with double portions. The singing of mass in the chapel having come to an end, loud cries were uttered there by clerics and others. Christmas was celebrated anew, called out by name again and again. And then nobles ran forward to give presents, cried aloud ‘New Year’s gifts’, offered them by hand’. When they washed their hands, politely they went to their seats, the man of the highest rank always more highly placed as seemed best; On the high dais were Edward III with his sons: John of Gaunt and the Earl of Cambridge with their Spanish wives Queen Constance of Castile and Princess Isabelle. The room adorned with tapestries and the table decorated all around with fine silks and a rich canopy over the high table. Many true men sat at the side tables and there was music of horns and noble pipes; wild and vigorous trillings wakened echos so that many noble hearts soared high with their strains; dainties were brought in with the music made up of most excellent foods an abundance of fresh meats and on so many dishes that it was difficult to find room in front of the people to set on the cloth the silver that held the various stews. Each man as he desired helped himself without restraint. A contemporary painting of a medieval feast from the Luttrell Psalter. It was time for a story and the late 14th century was a period when the romantic tales of King Arthur and his knights of the round table were very much in vogue. Here was the King of England with his princes and an assembly of knights from across Britain, France and Spain. Was not this assembly the equivalent to Arthur’s chivalrous court. A bard steps forward dressed all in green and starts to unravel the tale of ‘Sir Gawain and the Green Knight’. A story which begins and ends during the New Year’s festivities. He describes the wonders of Arthur’s court… his famous knights all assembled… the 1372 listeners imagine the scene…surely with good wine, Kingston, on a night such as this, can be imagined as Camelot….They are arrayed in their finery, the men noble, brave and handsome, the women gentle and beautiful. What if their feast was interrupted….Suddenly, before the music has come to an end…there is a sound… a commotion ….. and in strides a fearsome knight dressed all in green. Huge and awesome, he challenges the shocked assembly. He raises the two handed battle axe which he has carried into the hall. The room falls silent and nobody moves. The Green Knight begins to taunt them. King Arthur steps forward but a young and noble knight, Sir Gawain, who is seated beside Queen Guinevere, is shocked into action. His king cannot take up the challenge. ‘I will accept the challenge’ he says. Sir Gawain takes the axe and severs the head from the Green Knight. It falls to the floor and rolls to the corner of the room. A pause…. and then, to the shock of the assembly…the Green Knight rises from his knees, strides across the room, picks up his head and says. ‘Seek me at the Green Chapel in a year and a day and receive the return blow from my axe’ and with that he mounts his horse and rides out into the countryside. One can imagine the hush in Kingston Hall as the bard tells his New Year story. Sir Gawain has a year to live.. as a chivalrous knight he must keep his promise…and the seasons come and go moving towards the next New Year and the journey Sir Gawain must take…riding out towards to his nemesis…. The late 14th century manuscript of Sir Gawain and the Green Knight was only rediscovered among some documents in the 19th century. The language is beautiful and from its description of the medieval courtly life we can understand a little better what it would have been like to be at Kingston Lacy on New Year’s Day. Of course, the tale continues… travel in the depths of winter, arrival at a castle …where the Lord offers him hospitality …and his Lady offers herself …while her husband is out New Year’s hunting. Will Sir Gawain remain noble and true? Will he find the Green Knight and what will be his fate? Papworth, M., 1998, ‘Medieval Kingston Lacy’, Proceedings of the Dorset Natural History and Archaeological Society Vol 120.